Though Sharon has had many dogs over the years (and has dearly loved each and every one), she says Herbie surpasses all of them with his combination of playfulness, obedience, good looks, and ability to bring joy to all who meet him. Looking like a stuffed teddy bear entices strangers to plop on the floor in front of him and politely ask if they can hug him. He has happily obliged to infants as young as a month old and residents of nursing homes approaching their 95th birthdays. Herbie has plenty of energy; he can return from a 4 mile walk and take laps around the yard, yet he will remain calm as 15 students surround him all wanting attention at the same time. Sharon also says Herbie is the only dog she’s met who will not reach up to the table to steal a prime piece of roast even when left to his own devices. 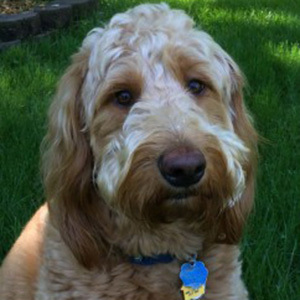 Herbie enjoys an active social life with his girlfriend Maggie Sue (a German shepherd) and best friend Walter (another doodle) and likes nothing better than inviting them over for a play date in the backyard. When a friend isn’t available, Herbie enjoys all of his stuffed toys. He quickly removes any squeakers or stuffing, but keeps the bits and pieces forever; he has many “blankies” and loves them all. Fetch is another favorite activity, but if no one is available he plays by himself, taking a ball to the top of the steps, shoving it overboard and springing after it. It’s always playtime for Herbie, unless he’s taking a nap in one of Sharon’s shoes.